TROY, MI -- (MARKET WIRE) -- May 15, 2007 -- Delphi Corporation (PINKSHEETS: DPHIQ) has produced more than 100 million airbags for vehicle manufacturers around the world, company officials announced today. The milestone was achieved during the first quarter of 2007, and confirmed during a review of the company's year-to-date operations. "Our team is excited to surpass the 100 million threshold," said Beth Schwarting, lead executive for Delphi's Safety Systems product business unit. "At the same time, we remain intently focused on building the internal development and manufacturing competencies we need to achieve future milestones like this one. For instance, our strategy to vertically integrate inflator technology plays a key role in Delphi's plans to deliver competitive, innovative airbag systems to our global customer base." In September 2004, Delphi announced it had acquired Dynamit Nobel AIS GmbH Automotive Ignition Systems, a designer and manufacturer of initiators, propellants, micro-gas generators and related products for the automotive industry, to strengthen its overall inflator technology portfolio. "With this acquisition, Delphi became capable of supporting the development and manufacturing of pyrotechnic and stored gas inflators," Schwarting said. "Now, we are applying these technologies to win with customers around the world." Delphi also confirmed the company has completed an expansion of its engineering facility in Munmak, South Korea. Recent upgrades include a new semi-hydraulic test sled, a mini sled for seat belt development and certification, safety-specific product development facilities, and offices to support increased staff levels. The test sled, now operational, supports enhanced safety system testing in the region. It is intended to aid in the development of products that help Delphi's customers meet increasingly stringent frontal and side protection safety regulations. "Delphi is building solid local capabilities to serve global vehicle producers wherever they do business," Schwarting said. "The installation of high-value test equipment in Korea tangibly demonstrates our commitment to our safety customers in Asia and allows us to provide them with high-quality, timely safety system testing." Delphi designed and manufactured the first production airbag in 1973. "Delphi has been at the forefront of airbag safety technology for more than three decades," said Schwarting. "The combination of our global footprint, experience in systems integration and robust portfolio of safety products has enabled Delphi to create significant value for our customers." Delphi is a leader in integrating a broad portfolio of safety technologies into systems that help to optimize performance and value for vehicle manufacturers. Delphi can deliver several frontal airbag designs with adaptive features such as cushion deployment volume, inflation output and venting based on crash conditions. They are compatible with customer instrument panels and easily integrated into vehicles. Delphi's dual-depth airbags are designed to protect vehicle occupants -- whatever their weight, stature or position -- in moderate to severe crash situations. Ongoing innovation has expanded adaptability to help boost protection for occupants of all sizes. 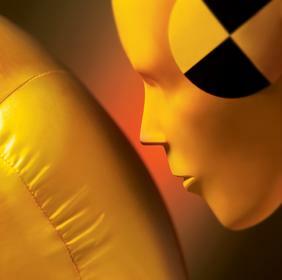 The company's curtain airbags provide head protection in side impact and rollover events, using unique inflator and cushion technology to extend protection during multiple impacts. Recent technical advances in Delphi's curtain technologies also offer efficiency improvements for vehicle makers during the development process. Additionally, Delphi offers a robust lineup of safety electronics. The company's airbag control units interface with its frontal impact sensors, side impact sensors, occupant classification systems, vehicle indicators and deployable safety devices to help determine targeted protection strategies for specific crash events. Other Delphi safety electronics include vision-based active safety systems -- including lane departure, rain sensing, active night vision, drowsy driver alert and driver distraction alert systems -- as well as radar-based technologies such as pre-crash sensing, smart cruise control and side alert systems. For more information about Delphi (PINKSHEETS: DPHIQ), visit www.delphi.com.